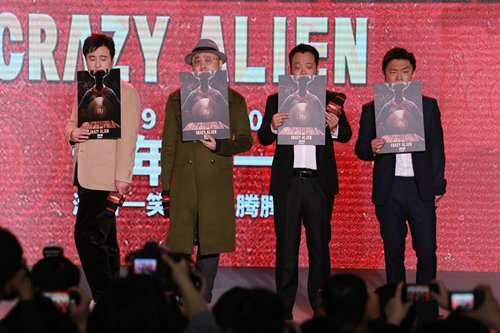 Crazy Alien [疯狂的外星人], the third movie in Chinese director Ning Hao’s Crazy series, will hit Chinese big screens on February 5, the first day of the Chinese New Year. In the upcoming movie, Ning continues with his usual style of telling stories from the perspective of a small fry, this time with a sci-fi twist. Inspired by Chinese sci-fi writer Liu Cixin’s story Rural Teachers, the movie starring Huang Bo and Shen Teng follows two brothers who hope to make a fortune off the unexpected arrival of an alien visitor. At the announcement, Liu said that he enjoyed Ning’s down-to-earth storytelling. Since his first movie Crazy Stone in 2006, Ning has made a name for himself with his black humor and the box-office success of his second film in the series, Crazy Racer.